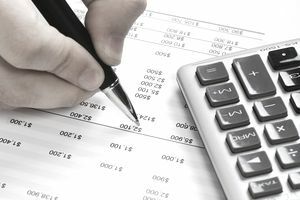 What is a balance sheet? What makes a balance sheet different from other financial statements, such as an income statement? To help you understand the answer to that question, let's imagine a scenario. Pretend that you are going to apply for a loan to put a swimming pool into your backyard. You go to the bank asking to borrow money, and the banker insists that you give him a list of your current finances. After going home and looking over your statements and account records, you pull out a blank sheet of paper. You write down everything you have that is of value including your checking accounts, savings accounts, certificates of deposit and money markets, mutual funds, stocks, bonds, real estate, cars, furniture, computers, and more. Then, in the middle of the sheet, you write down everything you owe including your mortgage, student loans, credit card debt, margin debt, and more. Finally, at the bottom of the sheet, you subtract everything you own from everything you owe to calculate your net worth. Congratulations, you have created a balance sheet. Just as the bank asked you to put together a balance sheet to evaluate your credit-worthiness, the government requires publicly traded companies to put together a balance sheet several times a year for their shareholders. It allows current and potential investors to get a snapshot of a company's finances. Among other things, the balance sheet will show you the value of the stuff the company owns, right down to the telephones sitting on the desk of their employees, the amount of debt, how much inventory is in the corporate warehouse, and how much money the business has to work within the short term. It is usually one of the first financial statements you want to analyze when you are valuing a company. A corporation, limited liability company, or limited partnership balance sheet differs substantially from an ordinary household balance sheet because there are a lot of complex items in the accounting records of an operating enterprise or holding company. Businesses have to deal with all sorts of difficult questions that most people do not such as how to depreciate and cost out a jumbo jet, how to account for the construction expenses of a power plant, ways to record lease obligations for retail space in a busy shopping mall, how to value large inventory stockpiles that might have gained or lost value since acquired, the proper method for establishing reserves for potential future losses on bank loans made to borrowers, and translating multiple currency assets and liabilities back to a reporting currency, just to provide a few examples. Before you are capable of analyzing a balance sheet, you have to know how it is structured. That is what this investing lesson aims to teach you. Specifically, we are going to walk you through a balance sheet line-by-line and explain the lay of the land, so you feel more comfortable the next time you encounter one. What does a company have? (Assets)? What does a company owe? (Liabilities)? What is left over for the owners of the company all debts were paid off? (Book value or shareholder equity)? All of these fancy words, advanced terms, and accounting complexities exist to give you, the investor, a good idea of how to estimate those three things. If you make yourself remember that is the objective, you shouldn't get overwhelmed as you wade into the waters of balance sheet analysis. Unlike other financial statements, the balance sheet cannot cover a range of dates. In other words, it may be good "as of December 31st, 2019", but it can't tell you about a period spanning from, say, December 1st through December 31st. It is because a balance sheet lists items such as cash on hand and inventory, which change daily. You'll find that the way to deal with this when calculating many ratios, which we'll teach you how to do later in this lesson, is to take the so-called "average weighted" figures of a balance sheet. For example, if you wanted to know the average inventory value for the year, you would take the inventory value at the end of last year, add it to the ending inventory value this year, then divide by two. It is a quick trick that helps you avoid distortions by ending period figures that may or may not reflect what was going on for most of the year. One illustration: If a manufacturing business paid off all of its debt during a year and showed $0 in liabilities on the balance sheet, yet you saw a line for interest expense on the income statement, you might be confused. By weighting the average debt outstanding from the balance sheet for the same period, you'd get a better idea of what as going on and why there were interest costs.